I recently watched the series ‘You’, which is exclusive to Netflix, and it got me thinking about this question. How far would you go for love? And not just to get it, but to protect the person you love? I started watching ‘You’ because the trailer really intrigued me, and Dan from ‘Gossip Girl’ plays Joe in this series. Having finished ‘Gossip Girl’ a couple of months ago, I thought I’d give it a go! The series was 10 episodes, and I binged the whole thing in about a week. While it was slow at times, with the narration of Joe meaning there was often less action, and more insight into his thinking, this aspect of the series was definitely intriguing, and it was disturbing to be inside the head of this man. This series definitely messed with my mind, and made me question everything about love and relationships. It is incredibly explicit, so definitely 18 plus, and it handled some pretty sensitive issues. 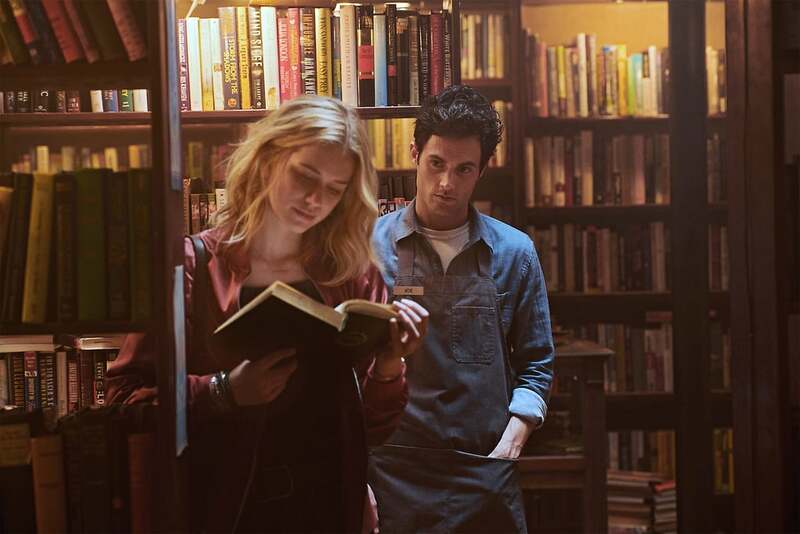 ‘You’ follows Joe, the manager of a book store in New York. Early on in the series he meets a girl browsing the shelves. Her name is Guinevere Beck, but people just call her Beck. They are instantly drawn to each other, but Beck leaves the shop without Joe’s number. So Joe does a little internet stalking, checking out her Twitter, Facebook and Instagram. He finds out a seriously scary amount about Beck by doing this. And then he crosses over into actual stalking. The stalking starts off casual, just standing outside her apartment and watching her, but then it turns a little darker, with Joe sneaking into her apartment, and even taking some of her clothes home with him, putting them in a box, which he hides in one of the ceiling panels above his toilet. Okay, so both of those things sound more than a little dark, but the series soon gets even more messed up, so in hindsight, the casual stalking is nothing compared to later. It soon becomes clear that Joe’s mission is not just to be with Beck, and make her fall in love with him, but to protect her. He finds out that she has serious daddy issues, and she’s being played by older men who just want to sleep with her, and don’t actually care about her. One guy, Benji, continually messes with her, and yet she keeps going back to him because she doesn’t know what a healthy relationship is. Joe desperately wants to protect her against him, and he takes the question of ‘what would you do for love?’ to extreme lengths. Or does he? Would anyone do what Joe does for someone they love? It’s a tricky, and slightly disturbing, question. Beck surrounds herself with toxic friends, such as the infamous Peach Salinger, who begins to suspect Joe of something (rightly so) and she distracts herself with these people, hurting her career as a writer and leading herself towards failure. Joe also wants to protect her against them, help her to come into her own in her writing and her life, and realise that she has potential, and doesn’t have to surround herself with these toxic, rich, shallow people to be successful. He wants to give her the best career she can have, and he wants to help her to flourish as a writer. Throughout the series, Joe paints Beck as someone that can’t look out for herself. He sees her making bad decision after bad decision, and he feels such a connection that he wants to help her. Even when him and Beck start going out, he still feels the need to look after her. Using his direct narration, Joe speaks about how he just wants to take care of her, just wants her to be protected against all the bad people in her life. Little does he realise that by doing this, he becomes controlling. He wants her to fit into a certain image of herself, and when she fails to do this, things escalate. Big time. I obviously could give a much more detailed review of the thrilling, scary and frankly psychotic stuff that happens in this series, but I really don’t want to give it away for people who have just started the series, or haven’t watched it yet. Like all thrillers, lots of its appeal rests on the idea that you have no idea what will happen. One of the things I loved to hate about this film was the narration of Joe, and how the viewer got into his mindset. Throughout the series, his view towards love and relationships is clearly warped in many ways, in his need to protect Beck, and the way he acts like she’s not capable of living her life without him. And yet. It’s almost as if you feel like his actions are justified throughout. It’s crazy to say it, but in his feud with Peach I was often rooting for him. She annoyed me so much, and yet she was the only one who was right about him. He so easily justified his actions throughout, and occasionally I got so much into his mindset that I too could see where he was coming from. I mean, that’s obviously the point, and the subtle reference to ‘Frankenstein’s Monster’ and this very idea was a nice touch. Even so, it made me feel bad, and made me question the human mindset. Are we all capable of the evil acted out by Joe? Would we all act in this way for those we love? I also liked the literary aspects of this series. Joe has been brought up around books, and the bookshop is such a beautiful place. But then also so haunting. I never thought books could have that potential for horror, but honestly that book cage in the basement of the bookshop- terrifying. I will not forget the scenes in that room. They really freaked me out. The way that Joe gave books to Paco, the little boy living next-door dealing with his mother’s abusive partner, was also an interesting relationship to build up. Joe was so sweet with Paco, helping him to escape through reading. And then he was so psychopathic towards girls. I guess it’s the idea of a charming front. No one has any idea what is going on behind closed-doors, like in many relationships. While this is obviously an exaggerated version, the story of Paco and Ron and his mother obviously shows another version of what can secretly be going on in a relationship, while everyone turns a blind eye. Scary stuff. One thing I would say about this series is that I wasn’t a massive fan of the ending. I thought that it was so sudden, and while it was obvious throughout that the series was dark, the ending was a little too dark for me. I don’t think I’ll forget it anytime soon, it really sent shivers through me when I watched that final episode. Not that I hadn’t been shivering for the rest of the series, but I just wasn’t expecting that to happen, and my sense of injustice was going crazy. Another issue I had was the character of Beck. I honestly just did not like her. Joe was so complicated as a character, because you dislike him so much, and yet the narration from his point makes you get into his head. But with Beck, she just annoyed me. She said ‘I’m a mess’ so many times that I just got so annoyed. She had a lot going on, but at the end of the day she needed to take action on her problems, and she loved self-pity way too much. And even when her career was on track, she still surrounded herself with the same toxic people. She was so weak, the way she just let people like Blythe (who was also incredibly annoying) push her around, and tried to blame all her problems on other people, or on her messed up family. Obviously, she didn’t have a smooth life, and we all have tendency to wallow in self-pity every now and again, but I just could not like Beck, as much as I tried. Overall, this series was so haunting, and it was really the little details and narration which made it. I was made to understand the mindset of a psychopath and, while this was incredibly disturbing, it was like nothing I’ve watched before. The ending was so scary and haunting. It really makes me want to read the book, by Caroline Kepnes. Have you watched this series? What did you think? Would you recommend the book? I watched the first episode because I wanted to watch Dan, of course, but it really creeped me out. I’m not saying I won’t watch it because I do have some desire to know what happens, but this is going to be a one episode at a time kind of show so I can mentally recover. I completely understand that! It creeped me out as well, but I just made sure I watched it when others were in the house haha! I have read the book. It was very well written and quite a page-turner, though also incredibly twisted and in some places too dark for me. Yes I agree, incredibly dark and twisted! But a good triller! Ooh this sounds compelling! I want to watch it, or maybe read the book. Thanks for a great review! I didn’t watch and wouldn’t want to. I’m careful what I watch and read, and this series wouldn’t pass muster with me. I was toying with the idea of watching this series yesterday and decided to go with a kdrama. I’ll have to give it a view though, it seems pretty interesting based on your review. This series was insane yet brilliant. I too wondered how far one would go for love. Just like in the movie Prisoners, how far would one go for their kids. I’m excited for season 2 of You to hit Netflix! I binged season 1 as well lol. It was such an easy series to binge, glad you felt the same! I haven’t watched the episode yet but will watch now for sure. I don’t know how far i would go for the one i love but i remembered that i did everything to protect her and let her go. It’s not easy for anyone to let people go when you want them in your life with any condition . Thanks for asking this question and sharing . Please share your thought on our new post . I love that series! It is so good and the topics are so very now with privacy issues on social media. What I find disturbing is that sometimes I kind of like Joe, maybe also because other characters are not so likeable as well and because Beck is also not so innocent in all of that. Amazing series. I have seen the first three episodes. I am very interested by this TV series. I think it really frames the main character as a complex and deep person. On one hand, he is super creepy and has his issues, and on the other, he mentors and abused child, he is kind to others (if they don’t get in his way?) and he obviously faced a lot of trauma growing up. It is important to remember that when these things happen, monstrosity can emerge from anyone. (No pun intended–) Do not judge a book by it’s cover. I had no idea it was a book! I just finished watching it this weekend a d absolutely loved it. I agree with you though, beck was not a likable character at all! I love the narration from Joe throughout though, I think it made it such a unique show with this spin on it! I watched a bit of this with my sister — she binged it and I was in and out of the living room all weekend, so I got the important bits without watching the whole thing. I didn’t really pick up on how annoying Beck was, but I think that’s because I didn’t see as much of her character due to the way I watched it. My friend expressed the same frustrations as you, and said she actually stopped watching it a few episodes in because the focus had turned too much to Beck for her liking. I wonder how this differs from the book. It’s kind of frustrating to see that the male psychopath is so well-developed whereas the woman is just pathetic and sad. Maybe I’m biased, but I think we need less sympathy towards cruel men and more sympathy towards the everyday woman, as interesting as the concept of exploring the mind of a serial killer may be. Haha, Beck is a bit of an annoying character it’s true! Hmm, I understand that, and for sure I had great compassion for Beck at times- I think it would be heard to argue she deserved to be a victim in any way! I did enjoy the complex narration of Joe however, but i completely agree with you 🙂 thank you so much! I don’t think Beck is supposed to be likeable. I still like her though, I found it much easier to understand Beck than I did Joe who was so obviously an incel alongside being a murderer. I don’t think Joe was supposed to be all good or bad throughout, I think what made him interesting is that he’s so multi-faceted. But a murderer is a murderer. Can I understand his motivations? Sure. Can I justify his actions? Hell no, and I don’t think any responsible human being could. I was so frustrated that his equation with Paco is what kept him alive. I was really hoping that Beck would survive by the end. I’m guessing the series is going to return based on that cliffhanger, but I don’t know how they’ll top it because the premise will be completely different to what we received from the current one. Either way, I need a new fix because I have no idea what to watch after this, I would count on Black Mirror, but I’ve finished watching every season, so now I’m in a show funk.